Spanning four days, dozens of locations on- and off-campus and more than 875 alumni and guests, Reunion Weekend 2018 was a tremendous success. 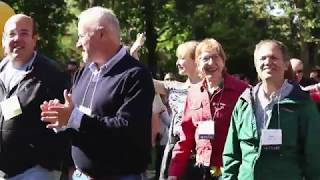 Twelve classes returned to Walla Walla, from the 65th reunion of the class of 1953 to the 10th reunion of the class of 2008 for the annual event. In addition to the standard reunion activities like class photos and convocation, alumni also stargazed on the roof of the Hall of Science, took walking tours of the campus art collection, peeked inside Stanton Hall and Cleveland Commons, networked with students and revisited local haunts. Organizing the event took the work of more than 275 staff, students and faculty. It also saw an outpouring of alumni generosity: More than $2.8 million was donated or pledged to support the college. "Coming back to campus for Reunion is special not just for alumni, but for staff and faculty, too," said Nancy Mitchell, director of Alumni Relations. "We're so grateful for the generosity of our alumni and the passion that they still have for Whitman College." More information about Reunion and the 2019 event details can be found on the alumni website.